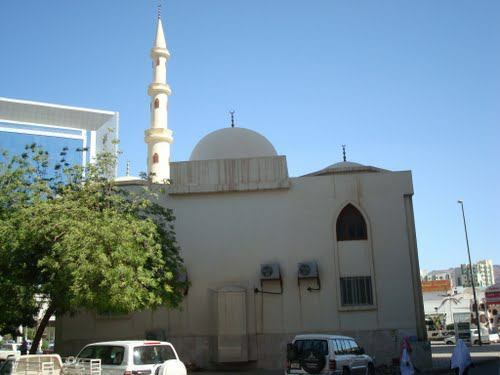 It was in fact a house of a companion of prophet Muhammad sallallaho allihi wasalam where once prophet Muhammad sallalla ho allihi wasalam had come and prayed with syedna Abdul Rehman bin Auf( r.A). Rasool Allah sallalla ho allihi wasalam made a very long Sijda in this mosque and syedna Jibraee allihisalam brought very good news that whoever will send Darood on Rasool Allah lsallalla ho allihi wasalam once, Allah subhan o talla will send upon him the mercy and peace ten times. In other words it is said that it was the place where those holy aya (verses) were revealed in which the significance of ''DROOD SHAREEF '' described which are really gift for whole umma till the day of judgement. If you want to reach there from Masjid Nabwi, come out of the Masjid-e-Nabwi from Main King Fahad Gate. When you reach to main road (King Faisal Road), turn to right. After the first signal, take left on Abi Zar Ghaffari Road and the mosque will come to your right after a while. IF YOU WISH TO SEE VIDEO OF THIS MASJID PLZ CLICK FOLLOWING LINK ON SEPARATE WINDOW.